Is January 12 too late to start a New Year’s Resolution? I know most resolutions have been abandoned for about a week now so it probably is too late to start a new one but, indulge me because this is important! Not only that, but I’m going to show you how you can keep it. I love when I see small businesses and organizations sending out their own email newsletters. It means that they’ve taken time to connect with their customers. It also means that they’ve take the time to come up with a theme, create a subject line, pull together content, find images, review the email for typos, broken links, etc. and then push the big red button to send the email to hundreds of people with no undo. It’s a lot of work and a fair bit of pressure knowing that you can’t un-send what has already been sent. The step that I want to focus on is the “Find Images” step. I’ve talked to a number of clients and friends about how they find photos for presentations, print materials, email newsletters, church handouts… and most start by searching Google for whatever concept they are looking for. Once they find an image that fits the concept, they simply download the image and use it without another thought. Let’s give it another thought. Let’s say our organization is going to have a party and I’m sending out my email newsletter to promote the event. 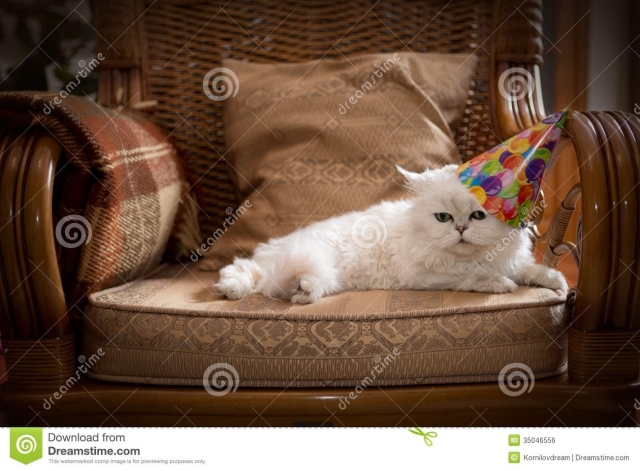 Everyone loves cats, so I decided to use an image of a cat wearing a party hat. So, I search for “free cat party hat” and the first result is fine. Just the kind of surly cat wearing a party hat that I’m looking for. So, I click on the image to see it full size and then I right click on it and select “Save as…” and voilá, the image is on my desktop, ready to use. Looking at the image, I see that I’ve gotten a bit more than I bargained for. In addition to the aforementioned feline, I also have some semi-transparent white stripes (no, not those white stripes), the word dreamstime and a logo running through the image. Additionally, there is a banner at the bottom with details of the image and where it can be downloaded. What’s going on here? We’re all pretty familiar with the © symbol but what is copyright. Instinctively, we know that it denotes that someone has ownership of an item. So what? How does that apply to me? Again, so what? How does that apply to me? The image that you downloaded falls under the copyright of the artist that created it. Obviously, the cat didn’t throw on a hat, set the timer on his camera and hop in the chair to take the photo of himself. An artist painstakingly rented studio space, wardrobed the cat, and expertly composed the photo to achieve the stunning result that sits on your desktop. Just because you were able to find it for free using a search engine, doesn’t mean that you are free to use it as you please. The artist is selling the photo through a stock photography service, in this case Dreamstime and should be compensated for his hard work. This is similar to the whole Napster / MP3 debacle of the late 90’s early 2000’s. The tool, in this case Napster, allowed users to freely download copyrighted works. For a pretty good movie on Napster, check out Downloaded. It was directed by the Bill & Ted guy not named Keanu Reeves. Stock Photography sites like Dreamstime, Depositphotos, iStockphoto, etc. sell royalty free licenses to images and graphics which you can then use in your email marketing, powerpoints, etc. Essentially, it boils down to the fact that you have to pay for the right to use the image. I care. You should care too. It’s easy to tell that you’re using the image without permission (ahem, illegally) and that you generally don’t care or don’t know any better. Neither conclusion paints your organization in a very flattering light. Especially when there are plenty of resources available for free or cheap photos. My favorite resource for stock photos is Flickr. You may not be familiar with Flickr but it’s kind of like the 2004 version of Instagram. It’s a popular photo hosting and sharing site where you can find photos for just about anything. Let’s not fall into the copyright trap again by just searching and downloading without doing a little research. Some photos on Flickr fall under a Creative Commons (CC) license that allows you to use the image, even commercially. Most of the time you just need to provide attribution or a link back to the original image. If you want to learn more about Creative Commons licenses, you can do that at the CC site. I know, seems like Greek, right? Flickr makes it very easy to find these images. First, do a search for whatever concept you are looking for (party cat) and then once your results start to show up, you can sort your images by License type (see image below) using the drop-down menu. There are three options: Any License, Creative Commons: Commercial Use Allowed, Creative Commons: Modifications Allowed. You will want to sort by Creative Commons: Commercial Use Allowed to find images that you can use in your newsletter (or powerpoint or whatever). The selection may not be as good - especially for very specific concepts, but if you can find what you are looking for then you are free to use it as you wish. Another great source of photos is the Wikimedia site which hosts thousands of photos. Again, make sure that the photo that you want to use falls under a Creative Common license that allows commercial use. Ignorance is bliss. That’s probably what you’re thinking. Unfortunately, you are now enlightened. Let your conscience be your guide. If you want to learn more about using images for your blog or organization, you should check out this post on the aka Media Marketing blog, Using Images for Blogs and Social Media: How to Avoid Copyright Infringement.